Ask any child what Santa looks like and he or she can probably describe him as a big guy with a white beard, a red suit and hat, and a reindeer-drawn sleigh. But how did the gift-giving habits of Nicholas, a Christian saint who lived in the third century, evolve into the myth of a jolly old elf that slides down chimneys? Two people, political cartoonist Thomas Nast and author Clement C. Moore can largely take credit for popularizing today’s image of Santa as a jolly, rotund fellow who wears a fur-trimmed red suit. But the evolution from St. Nicholas to the image of today’s Santa occurred over a long period. Nicholas was born in 270 AD in what is now Turkey. His parents were wealthy, devout Christians who died when he was little. Following the advice of Jesus to give to the poor, Nicholas gave away his entire inheritance to the poor and needy. He became the Bishop of Myra while still a young man, and continued to help those in need, particularly children. Nicholas was known for his generosity. The most popular legend about St. Nicholas tells of a poor man who had three daughters but couldn’t afford a dowry for them. This meant that they would remain unmarried and probably, in the absence of any other possible employment, would have to become prostitutes. Nicholas decided to help the man by going to his house at night and throwing three purses (one for each daughter) filled with gold coins through the window. Another version of the story has him throwing the coins down the chimney, which explains the connection to Santa’s preference for entering homes via the chimney. St. Nick received another boost a few years later when Washington Irving joined the society and published a work called Knickerbockers History of New York on St. Nicholas Day. 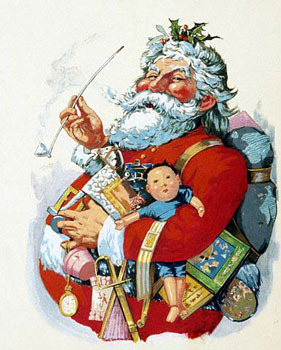 The work contained numerous references to a jolly St. Nicholas character. It was Clement Clarke Moore’s poem, “A Visit from St. Nicholas”, (now better known as “The Night Before Christmas”) that cemented the image of St. Nicholas as a jolly old elf with a little round belly, that shook when he laughed, like a bowlful of jelly. Moore reportedly wrote the poem for his family in 1822. It was first printed in a newspaper a year later, and it then became popular and was reprinted anonymously in a number of publications. Political cartoonist Thomas Nast helped popularize the image Moore created in the famous poem. In 1863 Nast began drawing a series of annual cartoons for Harper’s Weekly that was based on the character in the poem and in Washington Irving’s work. Nash’s Santa has a beard, fur clothing, and a pipe, and was the basis for many Santas to follow. He was also the one to invent the North Pole, elves, and Mrs. Claus. Naturally, Santa Claus is known worldwide, often under aliases and similar but not exact costuming. His job however remains the same. In the United States and Canada, he is known as Santa Claus. He is the Jolly old elf who traverses down chimneys to bring all the little boys and girls of the world gifts and good cheer. He is legendary, immortalized in song and book and seen in shopping malls everywhere. Most of us know he sometimes goes by Kris Kringle. This name originated in Southern Germany. Literally translated it means Christ Child. German children also refer to him as Weihnachtsmann, meaning Christmas Man. The French of course have Pere Noel, which isn’t that far from Spain’s Papa Noel. Spanish speaking countries and French speaking countries all refer to the sweet jolly old elf as Father Christmas when translated. Sinterklaas comes from the Dutch, and it is speculated that by slightly mispronouncing this name, the American “Santa Claus” came to be. This of course is just speculation, but it certainly makes sense. Countries such as Croatia consider Santa Claus to be more of a grandfatherly figure than a father figure, and thus have given him the name of Grandfather Christmas. Bulgaria sort of borrowed their version of Santa from the Russians, called him Grandfather Christmas and dressed him nearly identically. Some countries have various versions of Santa Claus that arenâ€™t readily related to Christmas celebrations. Often celebrating the 6th of December or thereabouts, the Santa Claus as Americans know him is actually more of a Christ figure, with literal translations meaning Christ Child or Little Jesus. These entities have the same effect as the American known Santa Claus, often bringing treats or gifts. Finland and Scandinavian countries are more partial to the â€œYule Goat.â€ The Yule Goat rides from house to house delivering all kinds of cherished gifts while in turn hoping for a nibble of porridge to keep him warm and energized for his very busy night. Lichtenstein and Austria refer to the Santa figure as ChristKind. ChristKind is a moderate blend of a religious entity and the more traditional understanding of Santa Claus. Italy has the entire family involved. Most recognize Babbo Natale as being Father Christmas, but the gifts are delivered by a woman who rides a broom instead of a sleigh, although she is not considered a witch. She is called La Befana and she fills the traditional Western impression of Santa Claus from upon her broomstick. Asian countries, outlying islands, even most Middle Eastern countries have some version of Santa Claus. While he may not be quite the same figure as Americans recognize, sometimes delivering gifts as early as December 5th, the notion is all the same. The only country that doesn’t recognize Santa Claus in one fashion or another is of course Israel, where most of the population is primarily Jewish and there is no Santa Claus that related to Jewish tradition. Traditions, dates, and even the core of Santa Claus’s origination vary from country to country. Some people celebrate him as a gift giver while others celebrate him as a historical religious figure. Of course, each individual entity is still modeled after St. Nicholas, who spent his life and his inheritance giving to those who needed and did so as anonymously as possible. As Santa Claus takes various forms, the nature of his purpose remains the same. His mission in this world is to deliver gifts, spread holiday joy and cheer, and of course, encourage the imagination of children everywhere. 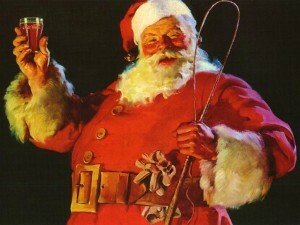 Jolly Old St. Nick is quite alive and doing very well in the spirits of people throughout the world.